It’s been fairly wet this winter in Greenwood, Indiana, and weather predictions call for more snow in the coming two months. With the cold temperatures, the precipitation means it’s possible that enough snow may build up on your roof to damage it. To keep your roof in good shape, make sure to schedule a new outdoor chore: removing snow from your house. The primary reason you should remove snow from your roof is so ice dams (large icicles) do not form. One cubic foot of ice weights 57 pounds, so you can imagine that damage ice can do to your gutters and the edge of your roof. Ice dams form when temperatures drop below freezing for several days and the snow of your roof doesn’t completely melt. The heat from your house melts the snow touching it, and the water then trickles down into your gutters, where it freezes. If enough ice collects in your gutters, or if the gutters are packed with snow or debris, water runs off the edge and forms icicles. The secondary reason to clean off snow is to prevent your roof from collapsing. Wet snow can weigh as much as six times as much as fluffy snow. That means 6 inches of wet snow can equal the weight of 38 inches of the fluffy stuff. All that weight adds a lot of stress to your roof. If the stress becomes too great, the roof will cave in. As a rule of thumb, clear snow off your roof after 6 inches accumulate in order to prevent ice dams. Clear snow off your roof after 12 inches accumulate to prevent collapse. You’ll know if you have too much snow on your roof if the interior door frames near the center of your home start to stick. When they stick, it means the snow is warping your home’s framing. If you have a two-story home, you’ll notice this more with upstairs door frames than downstairs frames. There are two ways to remove snow from your roof: raking and shoveling. Never use salt to remove snow and ice from your roof. The salt will stain your roof, and it will kill the plants around your downspouts when it washes off. Raking is a good method to remove snow if the raking is done on a regular basis. If you live in a small, one-story house, you can use a roof rake to reach most of all of your roof. If live in a taller home, do your best to clear off overhangs to prevent ice dams. Weak areas such as these are at the greatest risk of damage. When raking, start at the bottom of the roof and pull the snow off a foot at a time. Do your best to lift the rake when getting higher on the roof. Try not to push up. Also, make sure you pay attention to power lines. Do not get within 15 feet of the power lines to ensure you aren’t electrocuted. There are some limitations to raking snow off a roof. Rakes are not good at removing snow from valleys (where gables of your roof meet), and they cannot remove snow from tall houses well. Neither are they very good at removing wet, heavy snow. When looking for a roof rake, find one with rollers or bumpers on the bottom. The rollers/bumpers help minimize the contact with the roof so you don’t scrape off granules from your shingles. If you can’t find a roof rake like this, buy a plastic one instead of a metal one. Plastic will pull off fewer granules than metal. If you can’t use a roof rake or if you have too much snow to use one, the snow will need shoveled off. We do not recommend doing this yourself. You can easily injure or kill yourself on a wet, slippery roof, so it’s best to call a professional if you’re concerned about collapse. Professionals have safety harnesses, ropes, and other equipment that keeps them from falling. Stay off your ladder and stay off your roof. If for some reason you absolutely must shovel your roof yourself (which again, we do not encourage you to attempt), use a shovel with a plastic edge. And don’t shovel too frequently. Every time you shovel your roof, you remove granules from your shingles, which potentially reduces the life of your roof. Also, shovel down the slope of your roof, not up. If you shovel up, you may accidently rip shingles off the roof. Furthermore, don’t make pathways with your feet in the snow, as the snow you compact will turn into ice, which you can slip on easier. Also, ice dams are more likely to form if you leave a lot of icy footprints. Again, it’s best to call a professional contractor who is licensed and insured to clear snow off your roof. Professionals have safety equipment and specialized tools for snow removal on roofs. Expect to pay $250 to $500 for snow removal. While the price is steep, it’s less than the cost of new gutters or a new roof. When the people you hire finish, don’t expect a roof that’s completely snow-free. 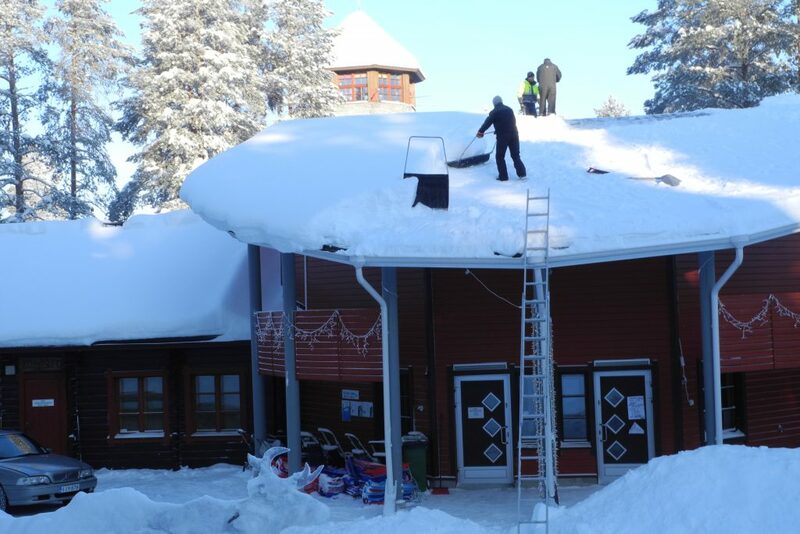 If the men removing the snow scrape too low, they’ll damage the roof. Understand, too, that their goal is simply to remove excess weight, not to remove 100 percent of the snow. If you ever do happen to experience a roof collapse, you can trust E3 Roofing & Restoration to put your house back in order. We handle insurance claims and will put together an unbiased inspection report and estimate for repairs at no cost to get the claim going and your life back to normal.